Deliveries are subject to a long wheel base ridged frame truck (approx. 10m long) with a pantect body (approx. 4m high), which must be able to reach your house or delivery address. 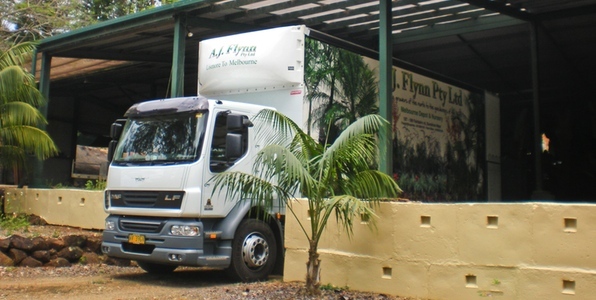 Our nursery is located in Mullumbimby 1 hour south of the Q.L.D. boarder on the coast. All deliveries take approximately 5-10 days, after ordered to reach their destination. Once your order is placed a confirmation will be sent within 24 hours with an accurate delivery date. If you have special delivery requirements, concerns or need to arrange an alternate drop off point, please let us know when placing your order or contact us via email. The carrier will deliver the plants to your letter box or inside your immediate front gate. He is not required to barrow them up a flight of stairs, around to the backyard or into a lift to other levels of your building. and GT Nursery Freighters going north to the Gold Coast and Brisbane. FOR OTHER DESTINATIONS PLEASE ASK FOR A QUOTE.